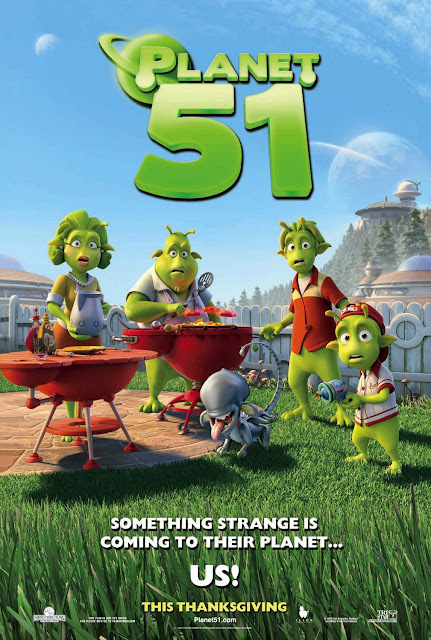 An American astronaut named Captain Charles T. Baker (Dwayne Johnson) lands on the supposedly uninhabited planet 51 and is shocked to find it is actually fully populated with an indigenous species of aliens with a culture very similar to 1950's America. Now, the native population believes Baker to be an invading alien that has come to eat their brains. Ilion Animation's "Planet 51" stars Dwayne 'The Rock' Johnson, who voices Captain Charles T. Baker, an American astronaut sent to explore planet 51. To his surprise, against everything he has known about the planet being uninhabited, it is actually populated with little green creatures who have a culture and mindset very similar to America in the 1950's. The native species appears very ignorant about space and science in general despite the fact they have flying vehicles and other seemingly advanced technologies. Science fiction horror films are very popular on this planet, too, and when Charles arrives, everyone assumes he is there to eat their brains. Luckily, everyone on planet 51 speaks English, making communication easy so long as the captain and this new-found species are willing to listen to each other. Easier said than done. This film has a solid voice cast featuring the likes of Dwayne Johnson, Gary Oldman, Justin Long, Seann William Scott, John Cleese, and Jessica Biel. Dwayne Johnson, even in animated form, is as charming as ever here. It is odd seeing The Rock's voice coming from a blue eyed, blonde haired white guy, and while it's certainly not a problem, we didn't expect it. Regardless, he does just fine. Seann William Scott and Dwayne Johnson have made at least 3 movies together, so we were not shocked to see his name pop up in the credits, though he doesn't seem to act much as he used to. Despite some good talent lending their voices to this picture, "Planet 51" is pretty dumb. We know, we know, not every cartoon/movie for kids has to be "Inside Out," but they do need to at least be good, especially if they are being shown to more impressionable generations. As a comedy, the laughs are few and far between. Most of the humor relies on pop culture references that were already outdated when the film was released, and are even older 7 years later. The animation is odd, but it's not terrible. We think kids will enjoy the brightly colored aliens, but it's blatantly obvious it was made by a studio that didn't really have a clue what it was doing, so it suffers a bit in its overall quality. The entire thing feels extremely slow and redundant for such a short movie. We found ourselves getting really bored with it quickly, but there it was, drudging on and on. When the end of it finally arrived, we welcomed it with open arms because it's was finally over. "Planet 51" is not so painfully bad that it will hurt your brain to watch, but it's not a real thinker and it clearly not intended for both children and their parents. Sure, The Rock is good even when he's only lending his voice to a character, but in a below average adventure family comedy like this, his talents are clearly lost in a sea of average.